SKU: SKU 144. Categories: Bags, Carolina Monogram, Clutches and Purses, Designer Inspired Purses, Designer Inspired Purses. 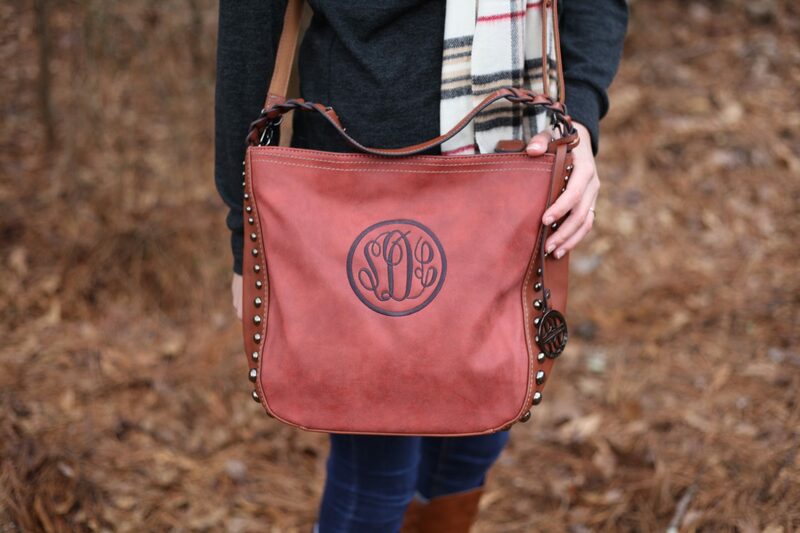 This rusty mahogany monogrammed purse puts a fabulous twist on the Southern Preppy look! It is so cleverly adorned with pewter colored studs giving this southern style purse just the right amount of bling to keep it tasteful. 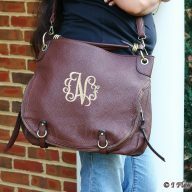 Its detachable and adjustable strap allows this to become a tawny monogrammed crossbody / hobo also – and it is all about the slouch! The shorter top strap turns this into a bucket tote! (The top strap is a braid style to provide a very comfortable and stylish carry tote). This bag by I Flew The Nest is big enough for all the ladies and is super easy and fun to carry. 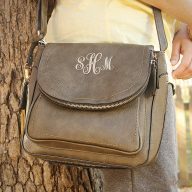 This monogrammed purse has a soft suede feel and is adorned with silver / pewter like hardware. Additionally it has a zip closure to keep prying eyes out and a zip pocket on the back exterior perfect for a cell phone. The interior has a nylon lining and one zip pocket for additional storage of personal items. 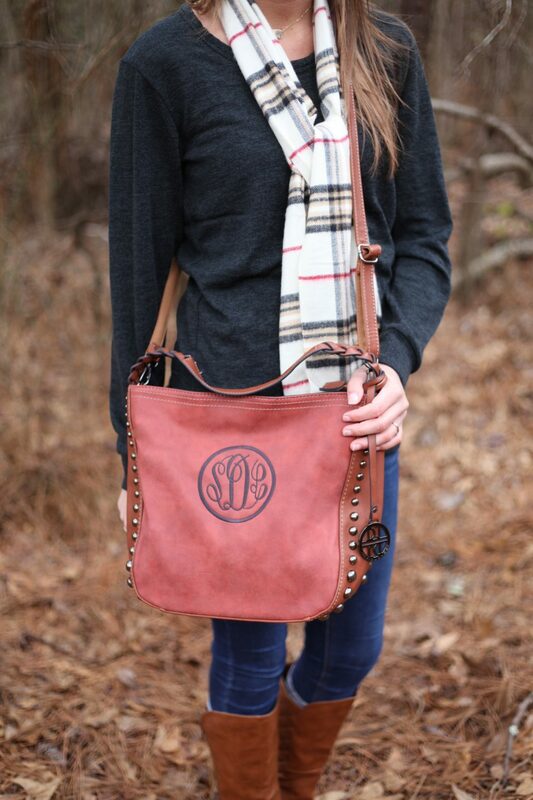 This picture features the rusty mahogany monogrammed crossbody purse with a cloister brown color thread and Master Circle font. 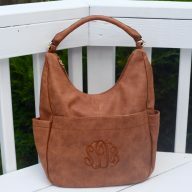 Additionally, there is a circle around the initials on this monogrammed rusty purse. If you would like your initials to also have the circle around them, please indicate this in your “comments” page at checkout. 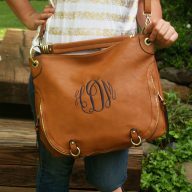 When you order a monogrammed purse from I Flew the Nest, we take pride in ensuring we provide you outstanding customer service and making sure your shopping experience is amazing. 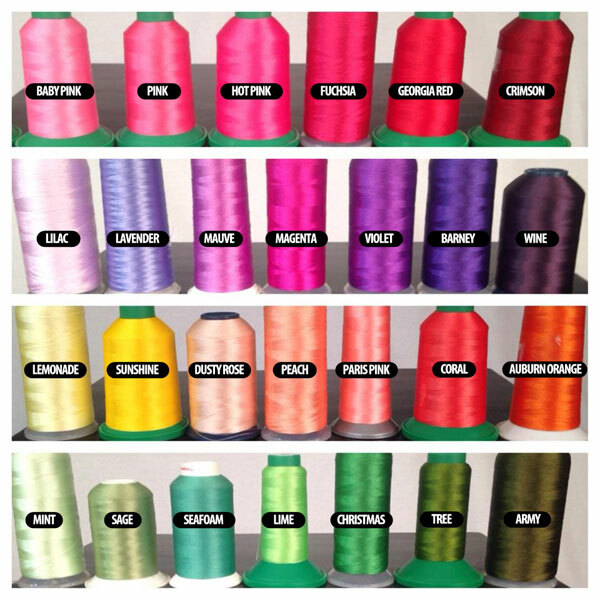 Our typical turnaround time is less than one week. If you ever have questions you can always call or email us and we are happy to assist! This is the best purse I have ever had!! I have had so many people ask where to go get one. Amazing bag for a great price. I am the type of person that weighs down my bag and it has withstood all! The only difference is, the one I bought is pink and they no longer carrier, but the red is just as gorgeous! I bought this in Paris Pink and was worried I wouldn’t like the color. I absolutely love this purse. It’s made of very high quality leather . It has such a clean crisp look. I also loved my monogramm on the front. I will definitely be placing another order again. I bought this bag for my daughter and was worried she would not like it. She loves it, she get complements on it all the time. I was worried about the color but the pictures don’t do the bag justice, they are way better in person. I also like it so much I got one for myself. I will for sure be buying some more of these bags, they are great gifts at great prices.